Why not have reusable wrapping paper and help the planet? Or maybe create some beautiful hand printed napkins for your next Holiday dinner party? 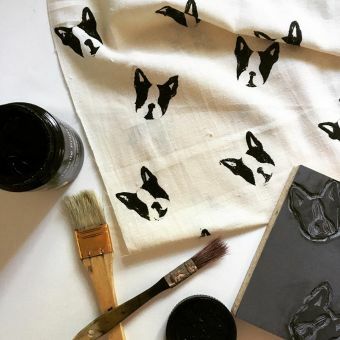 Learn all the techniques required to carve your very own block print and create your own custom fabric in this Saturday workshop! Explore colour palettes, printing techniques and how to make a repeat pattern with Jessica Trotter. And at the end you will have a piece of printed fabric that you can make into anything. ALL SUPPLIES INCLUDED. Be sure to bring a lunch and clothes you don't mind getting dirty!! NOTE: Lunch will NOT be provided but there will be a 30 minute break! Workshop Apparel: Please wear clothing that you don't mind getting messy. You are also welcome to bring an apron. *To have more one-on-one time with each student, I like to have small numbers in each class. That way, everyone gets a chance to ask me questions and see what I'm doing with an enjoyable amount of people.